Many San Franciscans remember the elegant department store that once graced the corner of Stockton and Geary streets, I. Magnin & Co. Like the City of Paris, once across Stockton Street, Ransohoff’s a few blocks away, and many other long-gone stores, these beautifully designed and lushly appointed stores evoke memories of a by-gone era when women wore hats and gloves to go downtown. Magnin’s was a favorite of the city’s socialites and other ladies who lunch with a taste for designer and haute-couture clothing. Its quiet marble facade on Union Square represented a graceful shopping experience. In 1988, R.H. Macy & Co. bought the exclusive I. Magnin chain of stores, including the flagship store, the white marble lady designed by architect Timothy Pflueger. 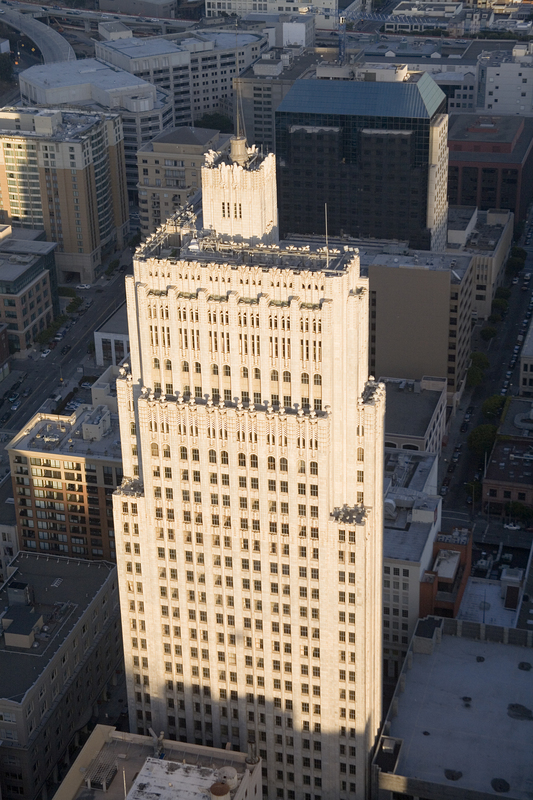 That deal was just one of many that began in 1944, when Magnin’s merged with Bullocks Inc. Ultimately, after more mergers and a proxy fight, the local retailing icon became part of the conglomerate Federated Department Stores, after Federated bought Macy’s. Magnin’s, though, a high-end luxury retailer, did not last long in the Federated chain, which sadly closed the stores in 1994. Many in the retailing business suspected that Federated/Macy’s only wanted Magnin’s for its prime location facing Union Square and adjacent to Macy’s. A major renovation was done in the late 1990s to create a modern glass facade and unify the disparate Macy’s buildings on the Geary Street side of its vast complex, including a major seismic upgrade. The interior of the once-gorgeous I. Magnin store was completely gutted. Long gone are the glorious pink Tennessee marble floors, the bronze elevator doors, the glass hand-painted mural on the ground floor, the intimate salons with scalloped ceilings and marble, chrome and glass everywhere. Glass chandeliers in the style of Lalique and gorgeous display cases were all hand picked by Grover Magnin, who traveled to Paris with Pflueger to get ideas for the store. While I. Magnin Union Square was probably Pflueger’s piece de resistance of all his work for the Magnin chain, he died of a sudden heart attack in 1946, and was not alive to see the store’s grand opening in 1948, or how it became a beloved fixture in San Francisco. But what is little known – except to savvy shoppers in Union Square – is that one small vestige of the original I. Magnin store remains. On the sixth floor of Macy’s, just off the hallway near the elevators, is part of the original ladies restroom. Upon entering the bland powder room for putting on lipstick, unsuspecting patrons are sometimes surprised by the gorgeous interior in the next room. 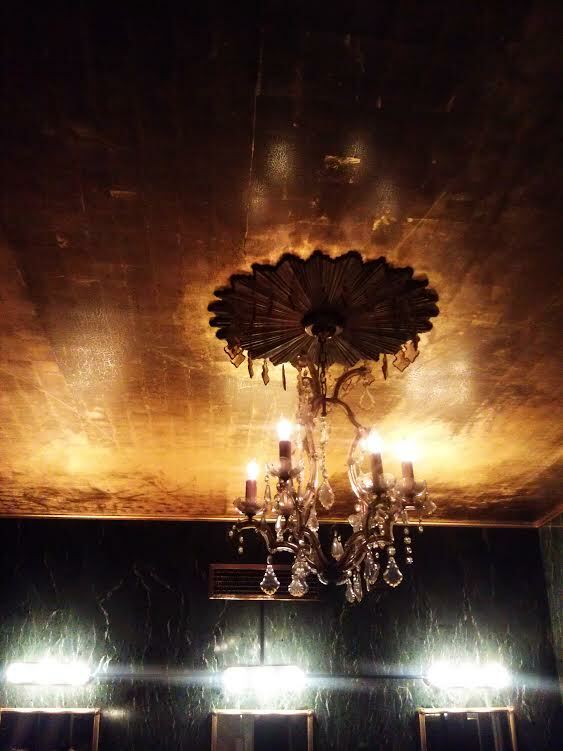 Black green marble covers the walls, contrasting with a gold-leaf ceiling. A glass chandelier hangs from an ornate bronze ceiling mount. Floor length antique mirror doors provide privacy in the stalls, and white-veined marble sinks sit nestled in bronze pedestals. For a brief time, the bathroom seemed to be in need of constant repair. One of the pedestal sinks was covered with a sign that it was out of order and on one visit last year, at least three bathroom stalls were out of order. But on a recent visit, the Timothy Pflueger Blog learned that Macy’s has found a sink, and repaired most of the restroom issues. “Maintaining and improving the historical bathrooms has been an important ongoing project here at Macy’s Union Square,” said Megan Prado, a spokeswoman for Macy’s, in a recent email. “We searched for several months and had distributors look for a historical sink to replace one of the three that cracked as it wasn’t able to be repaired.” Prado said Macy’s found one that was a great match. “We relocated the two existing functioning sinks and moved them to the exterior, and installed the new one in the middle. This gave the area a balanced look.” The stall door mirrors have also been replaced with new mirrors with an antique look. “We continue to do regular audits of the restroom to address issues as they arise in a timely manner,” she added. At least one small slice of Pflueger’s original design remains. For those of you interested in the history of I. Magnin, and other specialty and department stores founded by some of the city’s great entrepreneurs, I will be doing a talk for the San Francisco History Association on March 25. The talk is based on my research for a new walking tour I am working on for San Francisco City Guides. Hope to see some of you there! San Francisco’s iconic Golden Gate Bridge will celebrate its 75th year in service next month. Big festivities are planned all over the city, including a “spectacular event” organized by the bridge authority for May 27 at Crissy Field. A special website has all the details for the upcoming Golden Gate Festival. This year, there will be no bridge walk and the landmark will remain open to auto traffic, as officials seek to avoid a replay of the last big anniversary party. The CHS exhibition, which runs until October 14 , is a must-see for anyone interested in the bridge’s fascinating history. Especially intriguing are the fantastic renderings of concepts that were never realized, such as a dramatic Beaux Arts/City Beautiful promenade that would have lead to the bridge, and its not-so-well-known influences. One of the most interesting elements of the exhibit is the obvious influence that theatre architect John Eberson had on the bridge from his brief work as a consultant to Strauss. Eberson is not exactly a household name but he is well-known to theatre historians as the father of the so-called “atmospheric theatre” and the designer of over 500 theatres around the U.S.
John Eberson’s rendering of the bridge’s suspension tower, circa 1930. Courtesy California Historical Society. Pencil on vellum, on loan from the Architectural Archives, University of Pennsylvania. One of his more famous theatres in the U.S. is the Loew’s Paradise in the Bronx, New York, which opened in 1929 on the then-thriving Grand Concourse, which was recently restored in 2006. The Paradise was one of his three atmospherics in New York City, in which the architect sought to bring the outside indoors, typically with mechanics and lighting. These theatres often gave audiences the impression of seeing movies under an evening sky, with the moon and clouds moving overhead. 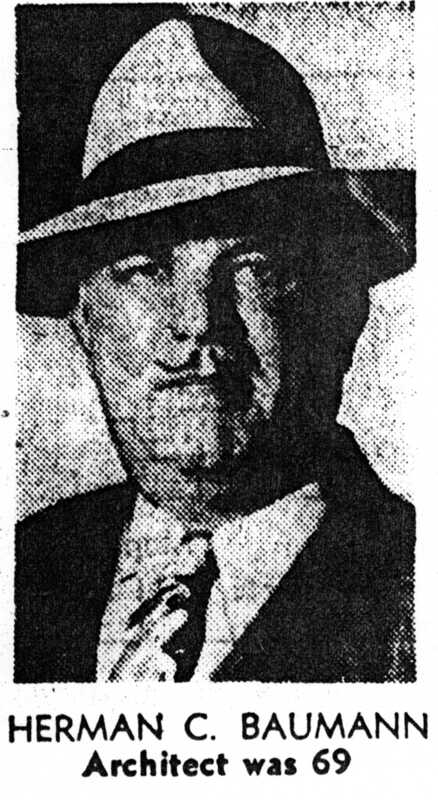 Eberson, a native of Austria, worked in St. Louis, Chicago and other cities before moving his office to New York in 1926, according to his obituary in March, 1954 in the New York Times. If all of Eberson’s drawings, or those of his successor, had been realized, there might be a far more dramatic entrance to the bridge, with a grand colonnade or walled portals, which as John King opined in the Chronicle last month, would have been unnecessary “theatrical trappings,” distractions from the site’s natural beauty. Even so, the dramatic influence of the father of the atmospheric theatre remains today in the bridge’s suspension towers, where the Moderne setbacks in Eberson’s 1930 rendering made it to the completed bridge. 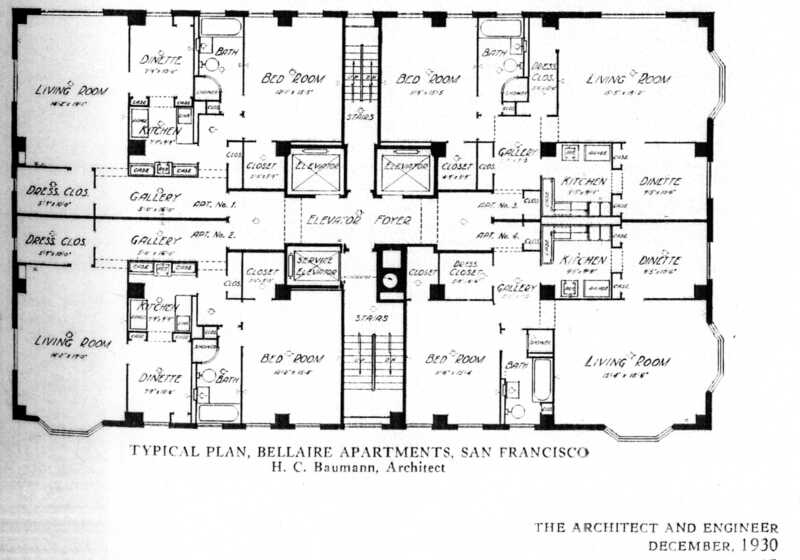 According to Starr, Eberson asked for more money to complete the project, but Strauss decided, based partly on a recommendation of local artist Maynard Dixon, and the need to comply with planning changes, to work with Bay Area architect Irving Morrow. Maynard Dixon painting of the concept of the bridge, 1930, courtesy Golden Gate Bridge, Highway and Transportation District. 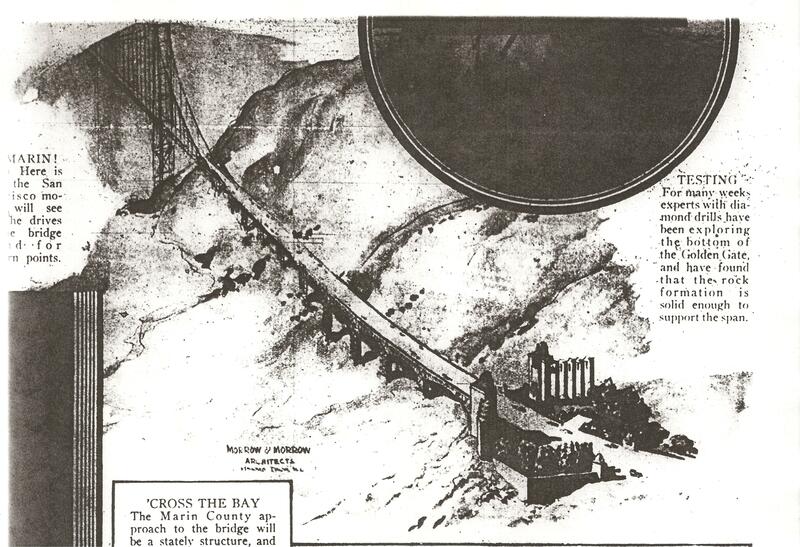 By October, 1930, a series of drawings in the Chronicle’s Sunday photogravure section on October 5 included proposed renderings of the “world’s greatest span,” by Morrow & Morrow Architects. 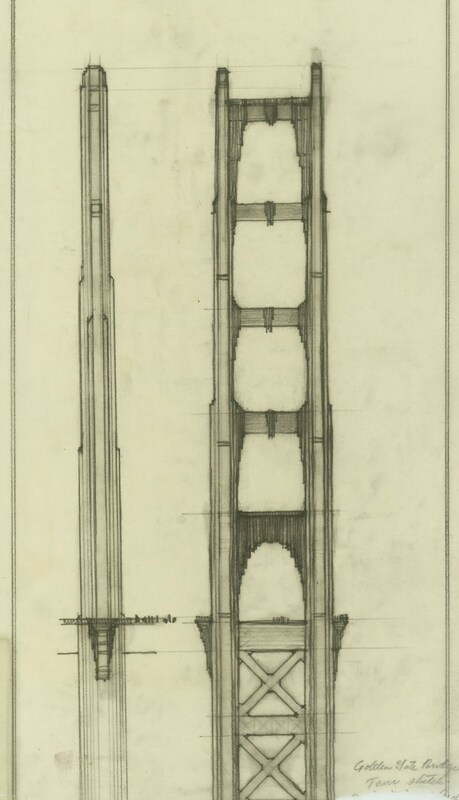 Some echo drawings by Eberson, with a dramatic, neo-classical approach to the bridge on both the San Francisco and the Marin County side. 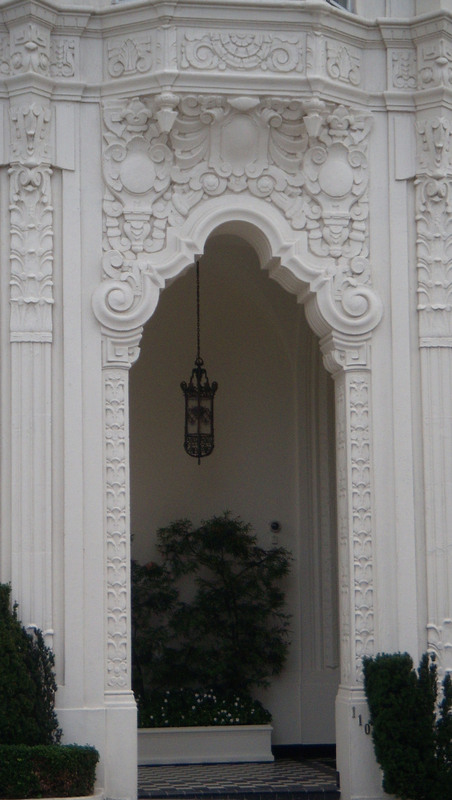 In the drawing of the Marin approach, below, architect Irving Morrow was influenced by both Eberson’s ideas, and Bernini’s colonnade at St. Peter’s Basilica in Rome, according to architect Donald MacDonald in his 2008 book, “The Golden Gate Bridge: History and Design of an Icon.” Morrow’s design for the San Francisco portal also called for high walls around a large plaza, acting as a wind barrier, and a grand plan for an exhibition hall. The father of the atmospheric theatre may have not worked on any theatres in the Bay Area, but his influence here is profound. MacDonald, who was the first architect to work on the Golden Gate Bridge after Eberson and Morrow, also notes in his excellent book that Eberson initiated the Art Deco style in the bridge. The style in the corners of the suspension tower’s bracing also echoes a theatre proscenium, MacDonald notes, as can be seen in this 1930s construction photo from the San Francisco History Center. 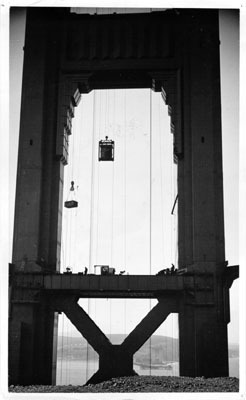 North Tower under construction, circa 1930s, courtesy of San Francisco History Center, San Francisco Historical Photo Collection. The gradual narrowing of the suspension towers as they rise was an improvement to Eberson’s towers by Morrow, according to MacDonald. Eberson’s stepped pattern in the towers also mirrored the gradual stepping of many skyscrapers built in the 1920s, which echo the pyramid shapes of the temples of the Maya and also allowed more light onto city sidewalks. 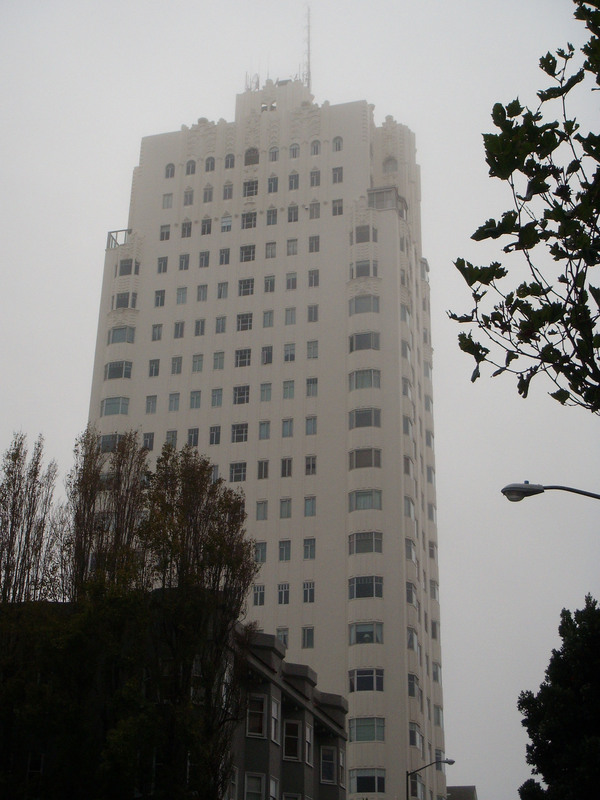 Timothy Pflueger’s Telephone Building at 140 New Montgomery was the first skyscraper in San Francisco to deploy that technique. Chicago architect Louis Sullivan had suggested setbacks as early as 1891, MacDonald points out. But it was Eliel Saarinen’s second place design of a skyscraper with setbacks for the 1922 Chicago Tribune Tower contest that really brought attention to the concept. While Saarinen’s design was not executed, it was the winner in the architecture community, including unflinching praise from the ever-critical Sullivan, and was far more influential than the actual winner. With the influence of both movie palace design and skyscrapers of the Jazz Age, no wonder the Golden Gate Bridge wins all the beauty contests, in contrast to her sister bridge, the Bay Bridge, whose 75th anniversary has not received nearly as much hoopla or attention. In addition to the CHS exhibit, the San Francisco History Center on the sixth floor of the main library has a new exhibit called “Bridging Minds: San Francisco Reads, 1933-1937,” featuring books, photographs and ephemera of the period and the works of California authors. San Francisco librarian and author Jim Van Buskirk will be giving talks about movies that have featured the Golden Gate Bridge, which has starred in more movies than any other American architectural icon. Not to be outdone, the Marin History Museum in San Rafael has an exhibition on how the bridge changed life in Marin County featuring construction photos from the renowned Moulin Studios, and photos from local photographer Jeffrey Floyd. Rain has finally descended upon a parched San Francisco, casting a perfect gloomy backdrop just in time for this year’s Noir City Film Festival. Aficionados of the dark film genre are looking forward to this year’s program, where San Francisco plays a role in some of the films, starting tonight at the Castro Theatre. Both familiar and long-gone buildings and structures can be spotted in several films, where our fog-drizzled streets, covert alleys and stairways, and lust-inducing vistas make the city an excellent backdrop for murder, double-crosses, and ill-fated romance. The festivities kick off with an old favorite, the 1947 film “Dark Passage,” starring Humphrey Bogart and Lauren Bacall. Bogart plays an ex-con on the run after escaping from San Quentin, where he was wrongly jailed for the murder of his wife. Enter Bacall, as Irene Jensen, who lets him hide for awhile at her chic San Francisco apartment on Telegraph Hill. The building her character lives in is one of the best examples of the Streamline Moderne style in the city, the Malloch Building. 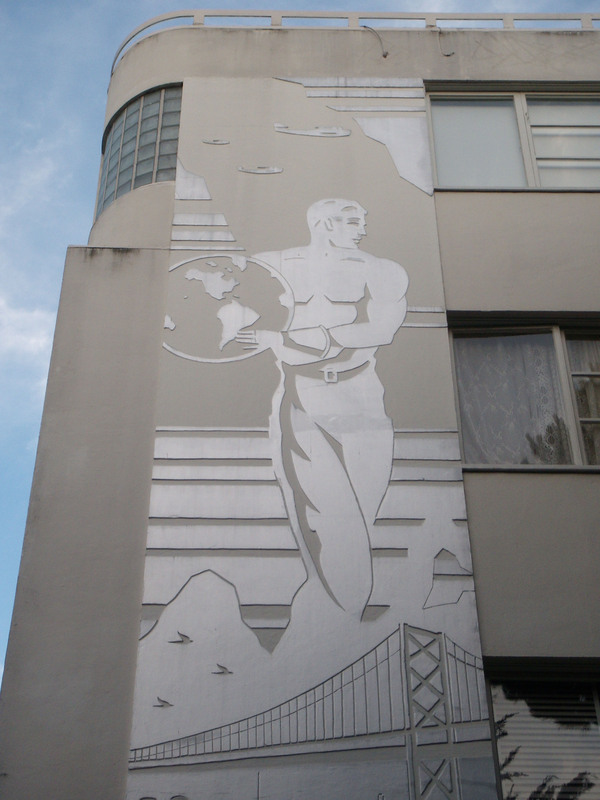 Streamline Moderne was the sleeker outgrowth of Art Deco that evolved in the 1930s, influenced by a variety of forces. Look for glimpses of this still-stunning building if you see “Dark Passage” at Noir City X, or anytime you see the film. Completed in 1937, the Malloch Building has a bit of mystery of its own. It was featured in a six-page article in the December 1937 issue of Architect & Engineer, which oddly excluded the name of its architect, and only mentioned the owners/builders, father and son, John and J. Rolph Malloch, and consulting structural engineer, W.H. Ellison. But in the early 1980s, local author and historian extraordinaire Gray Brechin solved the mystery. Brechin discovered the building was designed by little-known local architect named Irvin Goldstine, whom he interviewed for an article in a New York magazine called Metro. Brechin said that Goldstine did not have his architect’s license at the time he worked on the building, thus that explains why he is not listed as the architect of record. But while Goldstine eventually got his license in 1940, his work is not well known in the Bay Area, even though he designed many homes, apartment buildings and commercial structures in the Bay Area, according to architectural researcher Gary Goss. Brechin noted that while he was studying at the Ecole des Beaux-Arts in Paris, Goldstine was influenced by modernists like Le Corbusier and Erich Mendlesohn. The Malloch Building is a gorgeous example of Beaux-Arts planning infused with modern design and an embrace of art. The wood-frame building is technically six stories from top to bottom, and Brechin noted that its owners were sued for violating a city ordinance that prohibits wooden-frame structures of over three floors above a garage. But because each floor is stepped and set back, there are no more than three floors at a time above the garage, and the Mallochs won their case. The building, like many Streamline Moderne designs, is slightly evocative of a ship, as it sits perched at the top of the Filbert Steps, which Bogie trudges up in one scene in the movie. Other noteworthy features are its glass blocks, curvilinear lines, sand-blasted glass panels and three 40-foot high scraffito murals on the outside of the building. The then just-completed Bay Bridge is also featured in the mural shown here at the right. The murals, by artist Alfred du Pont, a friend of Goldstine’s, were made by applying colored concrete and carving it into shapes, a technique used in ancient Pompeii. 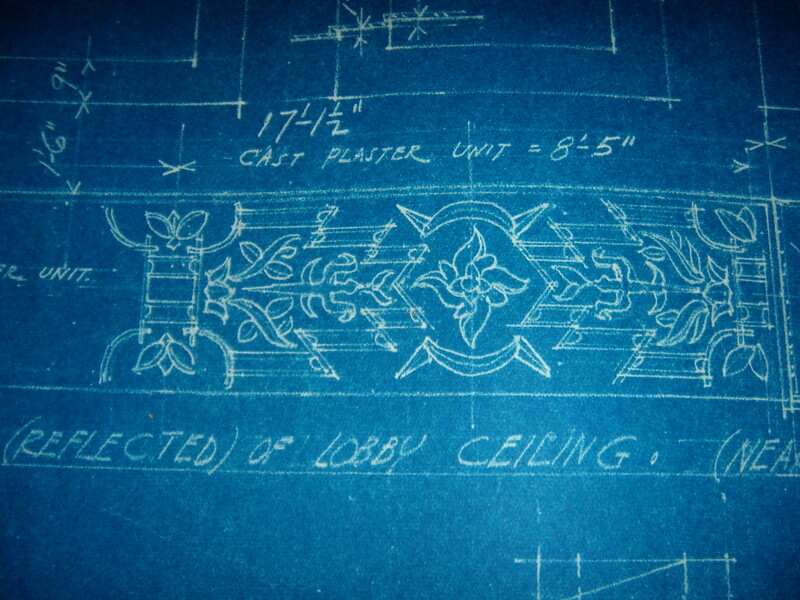 Scraffito, derived from the Italian word for scratch, was also used on the murals that grace the sidewalls of architect Tim Pflueger’s Castro Theatre. Originally built as an apartment house, all nine units and two penthouses were rented before the Malloch Building was completed, according to Architect & Engineer. “Telegraph Hill offers a certain Bohemian atmosphere that the public has found alluring and success of this particular venture has been an incentive for other investors to plan similar projects in this locality,” the journal wrote. In addition to the gorgeous views of the San Francisco Bay and the gleaming new bridge, tenants could also watch the building of Treasure Island and the Golden Gate International Exposition. Residents enter via a street-level open garden vestibule, where the sand-blasted glass portrays leaping deer or gazelles and exotic foliage, stunningly backlit at night. Interiors were described as including circular dressing rooms, built-in bookcases, and glass brick partitions. Moldings, baseboards and other non-essentials were eliminated. The dining rooms were circular with open, built-in shelving and every apartment was painted boldly in a different color scheme. Photos of the early interiors show planter boxes built into the glass brick windows, with diffused light shining through, a much sleeker, modern interior than was portrayed in “Dark Passage” when it was filmed 10 years later. Other venues to watch for in some of the Noir City films include a harrowing drive around Telegraph and Russian Hills and the grounds of the now-shuttered Julius Castle in Friday’s “The House on Telegraph Hill,” a 1951 film. The 1949 “Thieves’ Highway,” was shot in and around the former produce district, which was demolished for Embarcadero Center, and contains some of the best footage of that old market. Alcatraz and Fort Point both make an appearance in “Point Blank” a 1967 film about a man seeking revenge, starring Lee Marvin and Angie Dickinson. In a special treat, Dickinson will appear Saturday night for an interview on stage with the “Czar of Noir,” festival host, film preservationist and author Eddie Muller. The festival concludes with Bogart, playing the private eye, Sam Spade, in the 1941 version of “The Maltese Falcon.” A key scene in Dashiell Hammett’s 1930 novel takes place on Burritt, the dead-end alley off Bush St., down the block from the alley now known as Timothy Pflueger Place. 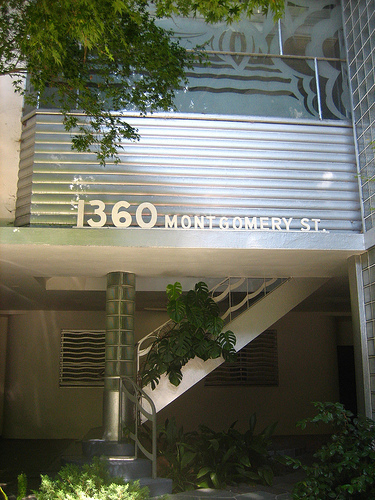 The modern elegance of 1360 Montgomery will likely outshine some of the other grittier locations seen in this festival. But there’s a lot to see over the next 10 days, including some long-lost vintage views of San Francisco. And don’t forget to watch your back! Ad for the El Rey Theater in November 1931 in the "San Francisco News"
The El Rey Theatre, the former movie palace that still towers over Ocean Avenue and parts of Ingleside Terraces, is turning 80 next month. To celebrate the anniversary, the Voice of Pentecost, which bought the building in 1977, is hosting a fund-raiser, and the organizers will be showing the same film that was featured during the Moderne theatre’s gala opening on November 14, 1931. This time, the movie, “The Smiling Lieutenant,” starring Maurice Chevalier and Claudette Colbert, will be shown in a digital format on a large screen on the stage. It should be a fun night. The organizers include the Ingleside Light newspaper and the Geneva Car Barn and Powerhouse project. The proceeds from ticket sales, which cost $25 each, are going to benefit the Geneva Car Barn project. The evening begins at 7 pm, with a talk given by architect Joshua Aidlin, whose firm Aidlin Darling Design has prepared plans to restore the Geneva Car Barn and Powerhouse, a non-profit youth arts project. The goal is to turn the 1901 building that powered and housed electric street cars into an exhibition and events hall, with classrooms, an auditorium, kitchen and cafe by 2014. A brief description of the architecture of the theatre, which was one of the last movie palaces designed by architect Timothy Pflueger, will be discussed by yours truly, with a few photos to compare and contrast the El Rey Theatre with other theatres designed by Pflueger at the same time: the Paramount Theatre in Oakland and the Alameda. One unusual feature of the El Rey is its massive stepped tower, which still stands today at 146-feet high. Once glowing with red and green neon tubing, the tower gave the theatre a skyscraper-like appearance that can still be seen from various spots in Ingleside Terraces. As you can see from this old 1931 ad promoting the opening, when the theatre was complete it had a beacon at the top, which was used to warn airplanes of the tower in the fog. The beacon also seems to have served as a built-in klieg light for the surrounding neighborhoods West of Twin Peaks.The El Rey’s big birthday party will be celebrated at the theatre at 1970 Ocean Avenue on Saturday, November 19 from 7 pm til 10 pm, with food, wine and live music. For more info, email info@elrey80th.com or call 415-215-4246. Don’t miss this rare chance to see a film in the old movie palace again. “The Smiling Lieutenant” was also nominated for Best Production, the early Academy Awards equivalent of Best Film, in 1931. In addition, authors and theatre experts Jack Tillmany and Gary Lee Parks will be joining me in selling our theatre-related books at special discounts to attendees (Tillmany has written Theatres of San Francisco and Theatres of Oakland, and Parks has written Theatres of San Jose). A new book that they co-authored, Theatres of the San Francisco Peninsula, recently published by Arcadia with many photos from Tillmany’s collection, will also be available. All of these theatre books, and my Art Deco San Francisco: The Architecture of Timothy Pflueger, make excellent holiday gifts. 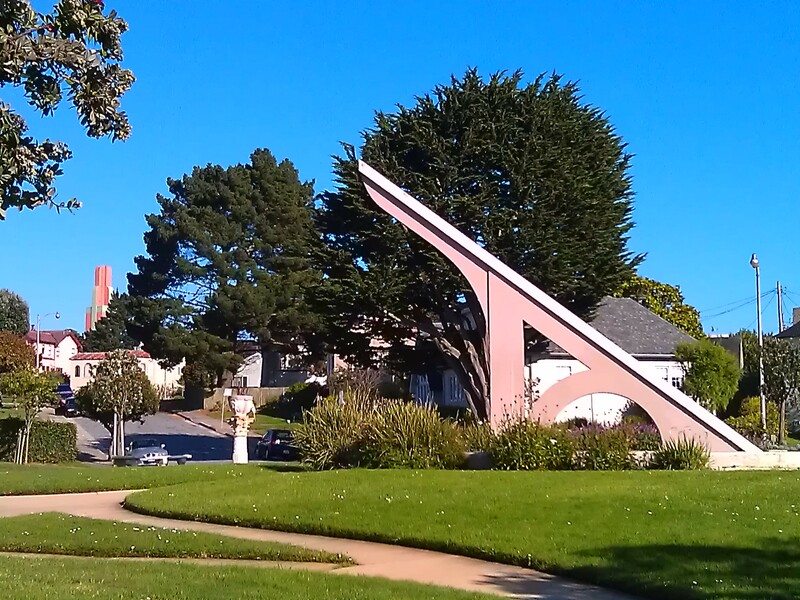 Sun dial in Ingleside Terraces, with the El Rey tower seen beyond the trees. Cole Porter please forgive me for messing up your lyrics, but last month I had a kind of late 1920s, early 1930s week in New York. After seeing the Broadway revival of “Anything Goes,” I still can’t get Porter’s witty lyrics out of my head. 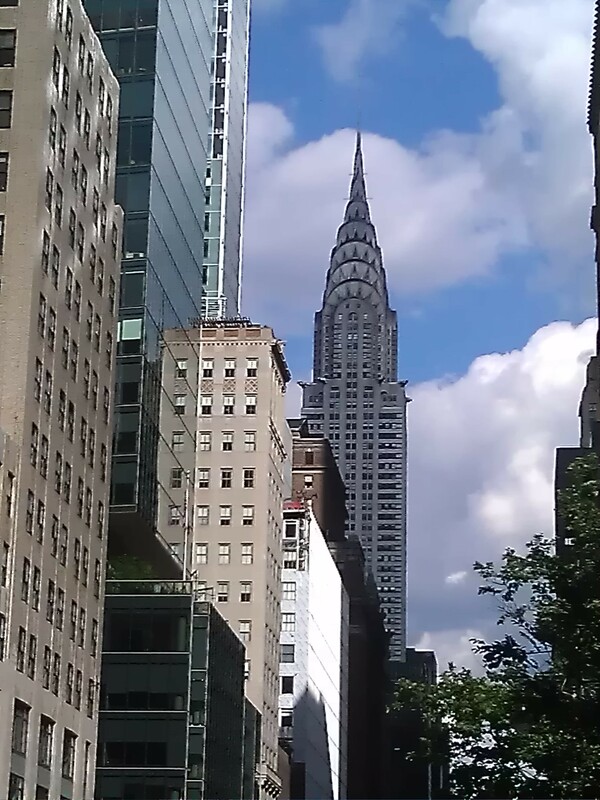 And they meld so well with many of the city’s glorious Art Deco icons, the most glamorous of all, of course, is the Chrysler Building, designed by architect William Van Alen and completed in 1930. The race between the builders and the architects of the Chrysler Building, who were competing with the Empire State Building and the Bank of the Manhattan Co. at 40 Wall Street to build the world’s tallest skyscraper, is well-documented in the 2003 book “Higher” by Neal Bascomb, a great read. Both the Chrysler and the Empire State still have their original stunning lobbies, that were part of the Roaring Twenties flamboyance, even though those happy, crazy times were nearing an end, unbeknownst to the architects and owners at the time. 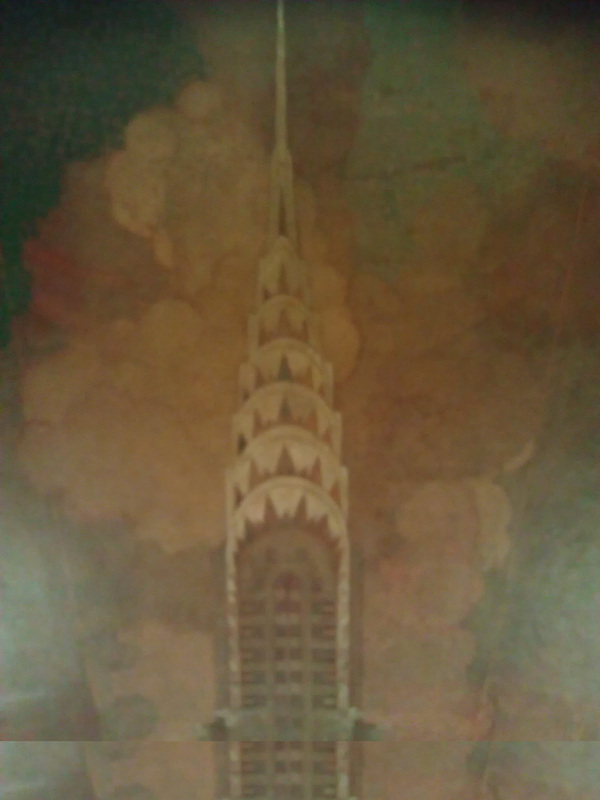 The Chrysler lobby has an immense ceiling mural by artist Edward Trumbull. This shot is of only a small portion of the vast 97-by-110 foot ceiling mural, called “Energy, Result, Workmanship and Transportation.” The mural was restored by EverGreene Painting Studios in New York in 1999, when the details of the ceiling were hidden by an aged polyurethane coating over the murals. In July, 1930, The New York Times advised its readers in a story about an exhibition at the Brooklyn Museum, to visit the “ordinary vestibules” of two newly completed buildings, the Daily News Building and the Chrysler, to see some excellent art work. On my visit this summer, in addition to seeing the ceiling mural, Moroccan red marble walls in the lobby, the famous clock and other details, I was able to get close to the elevator doors while I was visiting someone in the building. 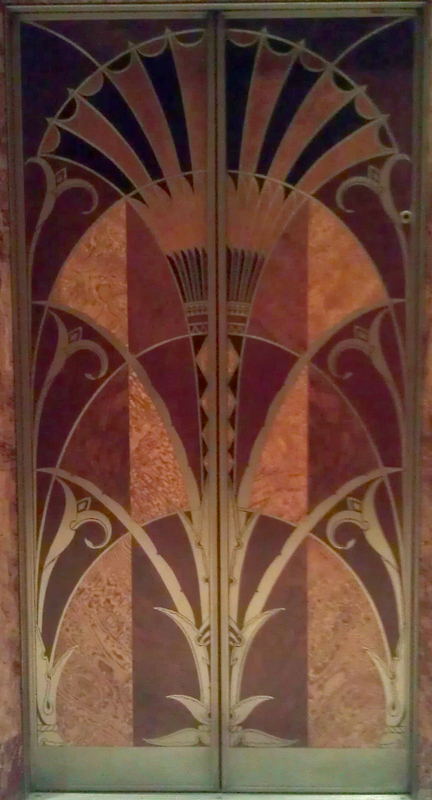 The elevator doors have a veneer of exotic woods, fashioned into a stylized floral pattern or a fan. Up close they are truly stunning and according to the book, New York, 1930, they are made of Japanese ash, English gray harewood and Asian walnut. Inside the elevators, the cabs include American walnut, dye-ebonized wood, satinwood, Cuban plum-pudding wood and curly maple. The interiors of all the elevator cabs are different. The tale of the career of architect William Van Alen, who was called the “Ziegfield of his profession” in American Architect in September, 1930, is a sad one. His career didn’t go much farther after the completion of the Chrysler Building, thanks in part to the Great Depression. His career was also hurt by the fact hat he had to sue Walter Chrysler for the bulk of his fee. He famously dressed for the Beaux Arts Ball in New York wearing an imitation of the crown of his best-known building. Its steel-covered dome was made of chromium nickel sheet steel panels. The material, called Norosta, was made according to German methods for the first time in th U.S., and the bulk of the work was done in metal working shops set up on the 67th and 75th floors of the Chrysler Building, while it was under construction, according to an article Van Alen authored for The Architectural Forum in October, 1930. Sadly, Van Alen died in 1954 leaving a widow, but no children and his office records have never been found. Architectural historians are like detectives, sleuthing to figure out what happened at the scene of a crime. They use old photos, blueprints, layers of paint and other materials beneath the surface of remodeled historic buildings, looking for clues of the original architect’s intent. They also try and determine what travesties occurred in the name of modernization. So a recent discovery of some blueprints of the old El Rey Theatre, at 1970 Ocean Avenue, offers some clues of what elements might have been left out, or what may be missing from the former theatre, now the home of the Voice of Pentecost Church. The theatre, by architect Timothy Pflueger, was one of three movie palaces designed by the firm in the early 1930s. Miller & Pflueger first worked on the Paramount Theatre for Paramount Publix, which opened in December, 1931, a month after the El Rey, designed for Samuel Levin and San Francisco Theatres Inc. The Alameda was designed for the Nasser Brothers in 1932. 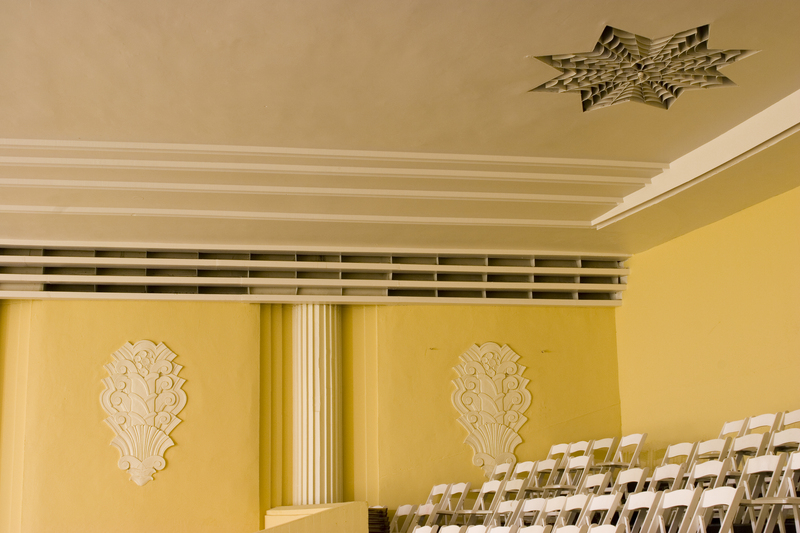 The three theatres were the most Moderne of Pflueger’s theatres designed from the ground up. 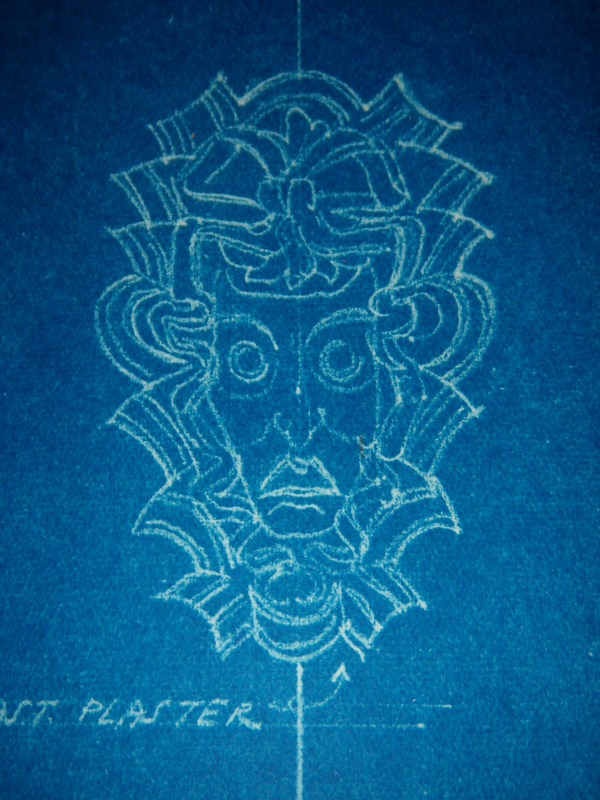 The blueprints of the original El Rey show that Pflueger intended a series of masks in cast plaster to adorn the sidewalls of the auditorium, amid a series of plain neo-classic columns. From the photos of the theatre’s interior today, it appears that Levin, the owner, might have decided on a less exotic look, sans masks, for the auditorium. But another possibility exists. Perhaps some of the missing ornament was removed when the theatre was closed or sold, a frequent occurrence. Stunning light fixtures were said to once grace the lobby. Murals, including one depicting modes of transportation, adorned the mezzanine, now an office, and were painted over by new owners. From news stories in November, 1931 when the theatre opened, the El Rey was described with “rich decorative details” a place where movie goers could escape their economic woes. A “gallery of mirrors” adorned the lobby. While we many never know if any of the faces or masks made it onto the sidewalls of the El Rey, Pflueger returned to the idea a few years later, in his detailed Lucite ceiling for the Patent Leather Lounge in the St. Francis Hotel, completed in 1939 and ripped out in the 1950s. (the bar was located in what is now the spot for Michael Minna’s restaurant). Two of the masks saved from the original ceiling can today be seen, painted gold and framed in the bar of the Tia Margarita restaurant on 19th Avenue and Clement Street. 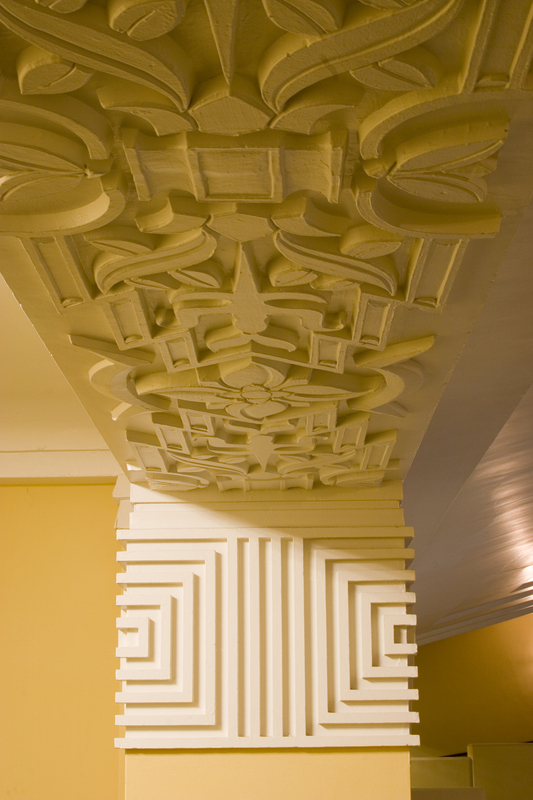 This bit of ornament can still be found in the remodeled El Rey interior, based on these pictures taken by Tom Paiva for our book, Art Deco San Francisco. 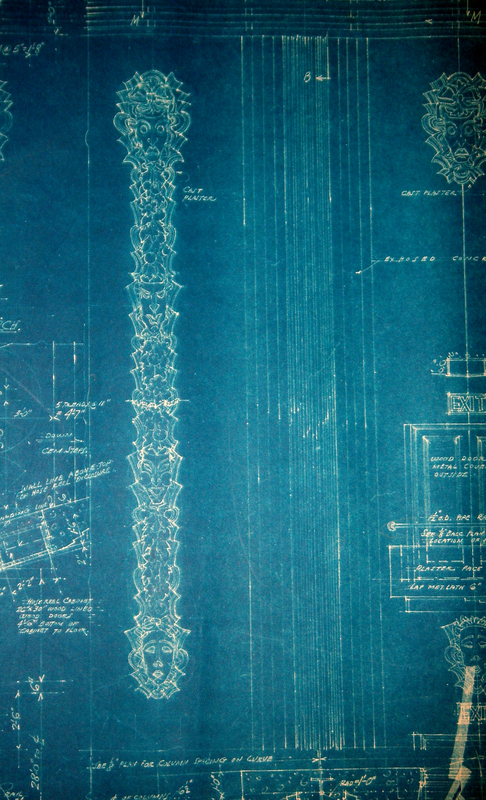 This is a drawing from a blueprint, followed by a photo from 2007 of the auditorium’s interior. 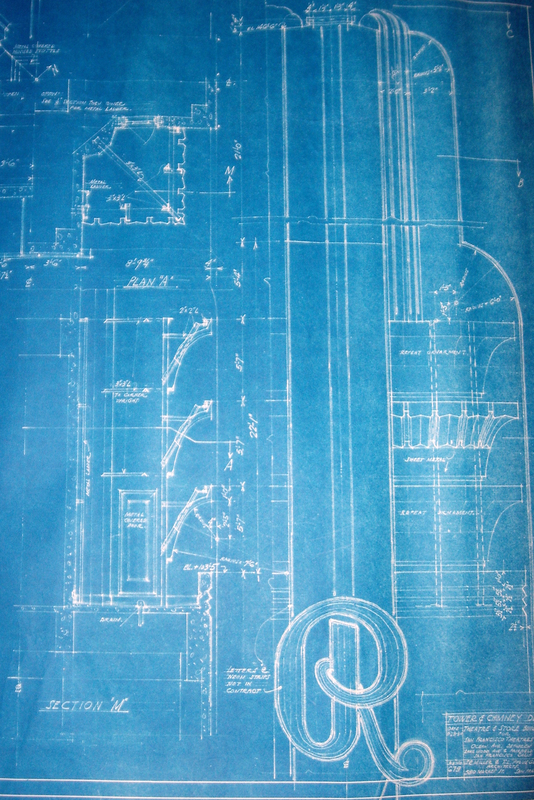 Another interesting revelation from the blueprints is a set of drawings of the tower and chimney. The top of the tower, which still stands today, was originally highlighted by red and green neon. The glowing tower beckoned evening crowds to the theatre in the frequent fog of the neighborhood. Blueprints for the El Rey’s tower indicate Pflueger intended a big swirling letter “R,” made of neon, at the structure’s bottom. But from an exterior photo of the theatre in 1931, it appears that this extra neon remained on the drawing board of Miller & Pflueger’s offices. The cost for additional tubing required for the curving “R” was perhaps seen as unnecessary. Instead, a photo in the San Francisco Chronicle at the time of its opening, shows the tower with simple block letters spelling out EL REY, possibly outlined in neon. News stories at the time mostly focused on the “flaming beacon” at the top of the tower, also used as an airplane beacon for planes flying into the airport, known as Mills Field at the time. So it does not look as if the signature “R” made it into the finished tower.